Need more columns? No problem! Monarch buffers and columns are all sold separately for your convenience. Monarch DNA Cleanup columns can be used to purify up to 5 μg of DNA from enzymatic reactions and agarose gels. Monarch DNA Cleanup Columns (5 μg), supplied with both the Monarch DNA Gel Extraction Kit and the Monarch PCR & DNA Cleanup Kit (5 μg), have been custom designed to deliver excellent performance for the purification of DNA from agarose gels and enzymatic reactions, including PCR. Monarch columns are designed without a frit (which is commonly used in purification columns to hold the membrane in place), eliminating buffer retention and the risk of carryover contamination. 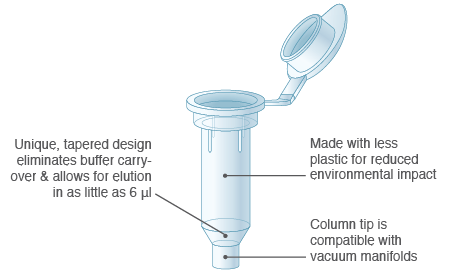 The tapered design of the DNA Cleanup Column enables elution in as little as 6 μl. Monarch columns are suitable for use with centrifugation and vacuum purification protocols. The columns fit snugly into the collection tubes to enable easy handling. Additionally, Monarch columns use less plastic than conventional columns, reducing their environmental footprint without compromising performance. Stand-alone Monarch columns are supplied with collection tubes.